Hmm. I wonder what its theology was. Are you suggesting that straight pins are predestined to fall of the cliff, while safety pins are predestined to stay on safe pasture? I thought rather that reprobate pins of either sort might be predestined to embrace the wrong sort of theology by which they will freely rush toward destruction and in the end show themselves to be reprobate. What's a Calvinist pin called? What are the pins doing so close to the cliff in the first place? Finatic: It is due to their pin nature that they push the limits like that. 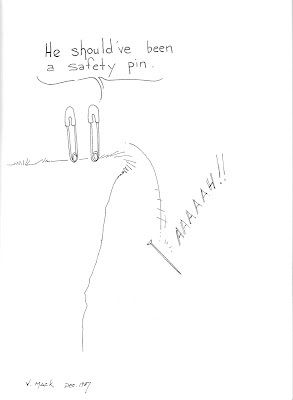 Even the safety pins are too close to the edge but at least they are traveling two by two, which is safer. Sonja: Are you suggesting that the safety pins are Calvinists? Isn't it always safer to trust to providence than to chance? If they're truly "safe"ty pins then they must be. How else could they sleep at night?? Sleep aide is for Pelagians. I just know it! In either case, Finatic is right. They are standing too close to the edge. If they are Calvinists, that might qualify as testing the Lord. Sonja - I think that it is time that you and Finatic get together and write a doctoral dissertation on the theology of pins. Consider the possibilities: Besides safety pins and straight pins, there are firing pins, hair pins, hand-grenade pins, bobby pins, cotter pins, and a host of others, I'm sure. Watch out, Alister McGrath!